The Scott Get Up and Ride Wisconsin Bike Challenge is off to a great start. In combination with Bike Fed of Wisconsin, the Challenge encourages Wisconsinites to bike as often as possible. Points are awarded for trips taken and mileage. 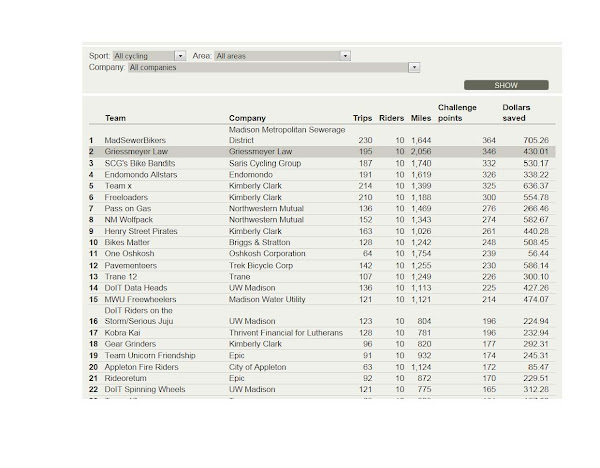 As of today there are 986 teams and 3,780 riders. The impressive part is that to date, the riders have logged 161,322 miles statewide and saved a total of $ 46,267.19 in gas. There are various categories that are recorded in the challenge including transportation/commuting miles/ recreation miles and total miles. 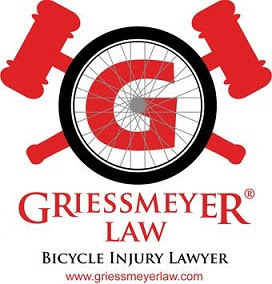 For the month of May, the Griessmeyer Law team logged the most total miles. For more info and to sign up a team go here. Clay, I've got a question for you. Is texting while biking legal or illegal? Since bikes are considered vehicles in this state, I didn't know if it the law automatically applied to bike riders or if bikes have to be listed specifically in the statute. Since the texting law refers specifically to "motor" vehicles, it is unlikely that the texting law would apply to bikes unless there was an exception of some sort. (a) No person may drive, as defined in s. 343.305 (1) (b), any motor vehicle while composing or sending an electronic text message or an electronic mail message. (a) Subject to the special provisions applicable to bicycles, every person riding a bicycle upon a roadway or shoulder of a highway is granted all the rights and is subject to all the duties which this chapter grants or applies to the operator of a vehicle, except those provisions which by their express terms apply only to motor vehicles or which by their very nature would have no application to bicycles. For purposes of this chapter, provisions which apply to bicycles also apply to motor bicycles, except as otherwise expressly provided. Thanks Clay, I appreciate your taking the time to answer the question so clearly. And a big congrats on the mileage for the Get Up and Ride Challenge. Anyone who leads the contest in this state puts a lot of hours in on two wheels (unless of course they ride a trike). You guys are talking the talk and walking the walk.